Pickup truck owners tend to fall into one of two groups. There are those who genuinely need the durability, power, and capacity of a full-size, heavy-duty truck, such as landscapers, construction workers, and RV owners. Then there is the second group of owners, who tend to enjoy the durability and capacity of a truck when hauling building materials from the local home improvement store or heading off-road for weekend camping excursions with the family. This group, however, usually uses their truck to commute to and from work, or haul kids back and forth to soccer games. It is this second group of truck owners that Honda is targeting with the 2006 Honda Ridgeline. Based on the same platform as the Honda Pilot and Acura MDX, the Ridgeline is unique in the pickup truck market. To begin with, the Ridgeline is the first mid-sized pickup to employ an independent rear suspension. This suspension has been employed in cars and SUV's for years, and in a light- to medium-duty pickup, it provides several advantages over a live axle. First, ride and handling are superior to what is usually provided by a live axle. Another advantage is that the stationary differential provides enough space under the bed to house an 8.5 cubic foot trunk that is lockable and weather-tight. It even features a drain plug, so you can fill it with ice and use it as a cooler. Tailgate party anyone? The Ridgeline's steel-reinforced composite bed is accessed via the pickup truck market's most innovative tailgate. Honda pays homage to station wagons of the 1970's by installing a tailgate that tilts down or swings out. This slick feature allows access to the bed without having to reach over the tailgate. The bed is wide enough to allow 4X8 sheets of plywood to lay flat on the floor; a feat that no other compact or mid-size pickup can accomplish. Even the construction of the Ridgeline is unique. Honda mounts a uni body atop a fully boxed frame to create a vehicle that is both rigid and strong. 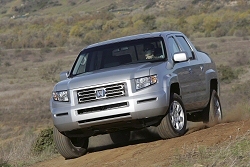 Honda claims that the Ridgeline is more than 2.5 times stiffer that the best performing body-on-frame compact pickup. The disadvantage to this belt and suspenders approach is that it contributes to the Ridgeline's portly 4500-pound curb weight. The only available engine is a transversely mounted VTEC 3.5 liter V6 engine, developing 255 hp and 252 lb-ft of torque. This power helps it tow 5000 pounds, or haul 1100 pounds in its 5-foot bed. To aid in towing, the Ridgeline comes equipped with transmission and power steering coolers. In keeping with Honda tradition, the Ridgeline is the first compact pickup to meet Ultra Low Emissions Vehicle (ULEV) standards in all 50 states. It also returns a rather respectable 16/21 mpg. Power is delivered to the drive train via a 5-speed automatic transmission, and the drive train offers all of the latest gadgets as standard equipment, including VTM-4 (Variable Torque Management) and VSA (Vehicle Stability Assist). The Ridgeline is only offered with 4 doors. The 5-passenger cabin is spacious and flexible. The seats are wide, but supportive, and the rear seats flip forward to accommodate boxes and luggage you want to keep dry. Honda claims that there is enough space available to store a full sized mountain bike with the front wheel removed. Cloth seating surfaces are standard, but leather is available, as is a voice-activated navigation system and an XM radio receiver. Gauges and controls are typical Honda: large, logically placed and easy to read. The Ridgeline will be available in RT, RT-S and RT-L trim levels, with prices ranging from $27,700 to $34,490. In addition to the aforementioned drive train systems, standard equipment will include a towing package, power windows and locks, an automatic heated wiper zone on the windshield, integrated bed lights with an auto-off timer, and a 100-watt, XM ready 6-speaker stereo system. Look for the Ridgeline at your Honda dealer in March of 2005.